Fellow Seibertronians reluctantyouth and LongHaulLaser have brought to our attention a slew of new Transformers figures now available on Hasbrotoyshop.com. We first learnt that the highly sought after Brakeneck and Quickslinger were available as well as Combiner Wars Cyclonus. Please note that while there is currently the Memorial15 promo code for 15% off an order and free shipping over 50$, it may not be eligible for the online exclusive Combiner Wars figures. Quickslinger is now sold out on BBTS (12:55 PM CDT). Just keeping peoples informed. I'm tempted to ship my POL now. Aww Cyclonus and Offroad feel left out, it is like the Rudolf the Red Nosed Reindeer song! "We're a couple of misfits..."
Agamemnon wrote: Quickslinger is now sold out on BBTS (12:55 PM CDT). Just keeping peoples informed. I'm tempted to ship my POL now. 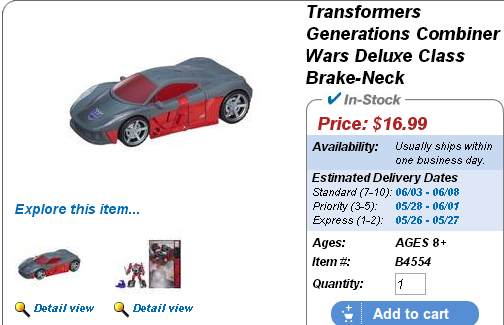 As of 3:48 pm EST, BBTS is listing Quickslinger and Brake-neck as in stock. Some replies that I've read here. Are stating BBTS keeps updating with, out of stock and in stock. Might be that clearing up of duplicate orders or people who order more than one. Based on how far we are into the day, I imagine most will have their chance to get these guys. Yes, but he and his size class have their own thread for them. Yes doesn't do my level of excitement justice. I loves me some UM! I'm also one of the crazy ones who likes him in a nice shade of baby blue. Me likes some baby blue UM too! Looks like Magnus is probably one of the best Generations figures yet! And Sabrblade, I know that, but this is Combiner Wars. Silly wrote: And Sabrblade, I know that, but this is Combiner Wars. Right, but the mods felt the Leader class toys were distinctive enough from the rest of the actual combining toys to warrant their own separate thread for discussion pertaining to them. Just trying to help us play by the rules. K but I already made my comment lol. So how bout them MLP figs that are probably coming out? carytheone wrote: So how bout them MLP figs that are probably coming out? You mean the alternate Fan-Built Combiner? I wonder if the newly introduced comic characters such as Nautica, Firestar, Velocity etc are part of the fan build combiner! I would love to have a voyager comic version of Firestar with flaming hair! They are not. The artist confirmed that they are separate fembots from Victorion's components. So, yay, even more fembots! Yay, I guess. :\ I wanted to see a Firestar, but I am happy to see even more Fembots! I do now. I forgot about that one. Man, do we know much of anything other than name and origin?